SizeSite: 11 ½ in. x 8 ¾ in. Overall: 19 ½ in. x 16 in. Oliver Clare (United Kingdom 1853-1927), Oil on Canvas “Still Life of Grapes, Raspberries and Plumbs on a Mossy Bank” signed lower right, Oliver Clare in a decorated carved wood frame. Site: 11 ½ in. x 8 ¾ in. Overall: 19 ½ in. x 16 in. 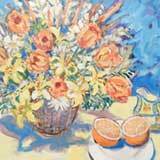 Oliver Clare was the son of still life artist George Clare, and the family members specialized in floral and fruit still-life paintings. Oliver Clare produced postcards and posters for the health firm “Health Food Stores.” Clare exhibited at the Royal Society of Artists – Birmingham, Royal Glasgow Institute of Fine Art, Walker Art Gallery – Liverpool, Manchester City Art Gallery, Royal Academy, Royal College of Art.